The Shure SM58-LC Dynamic Vocal Cardioid Microphone lives up to its viral popularity... One of the most outstanding things about the Shure SM58 is that you can stick one in front of any kind of vocalist (and most instruments, for that matter) and get excellent results. It's a fact - even though it's best known today for its near indestructibility, no one would have cared about the SM58 in the first place if it didn't sound amazing. The secret to the SM58's sound is its critically tuned frequency response, which cuts out low-end rumble and adds a noticeable rise in the upper-mid frequencies. This deliberate presence peak adds warmth and clarity to your vocals, but it also lets you get the most out of a wide range of sources, including guitar cabinets, brass, and many other instruments. Here's something you probably didn't know about the Shure SM58. These handheld microphones are built to very tight standards. What that means is that an SM58 is going to sound like an SM58, so you can mix and match and add more SM58s to your collection, and you're always going to get the sound you expect. What's more, they all have the same focused cardioid polar pattern. That's great onstage, where you have to worry about bleed from the mains causing feedback. It's also a bonus in the studio, because it lets you get solid isolation between your vocals and instruments. We can't mention the trusty SM58 without talking about its legendary toughness. Drop it from a skyscraper, run over it with a box truck, freeze it, drown it, bury it in soft peat for three months - it's all been done to the SM58, repeatedly, and there are YouTube videos to prove it. And the best part is that not only will this heroic mic continue to function after serious abuse, it will sound exactly the same as it did before. 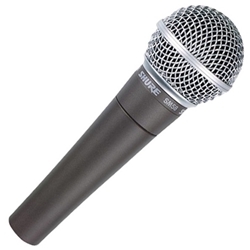 Now, do you think a little thing like the normal wear and tear of stage life is any match for your SM58? No way! Buy a Shure SM58, and you've got a killer mic you can put in your will.